I know I've been gone for a week, and I'm super sorry. I fully intended to have several new posts, including a fun party appetizer recipe and a new post about London. BUT. I've been sick all week. Usually, even when sick, I can keep up with blogging. That's what laptops are for, right? Sometimes though, I have flare ups that knock me out and leave me sleeping 18 hours a day. Which is what happened this week. 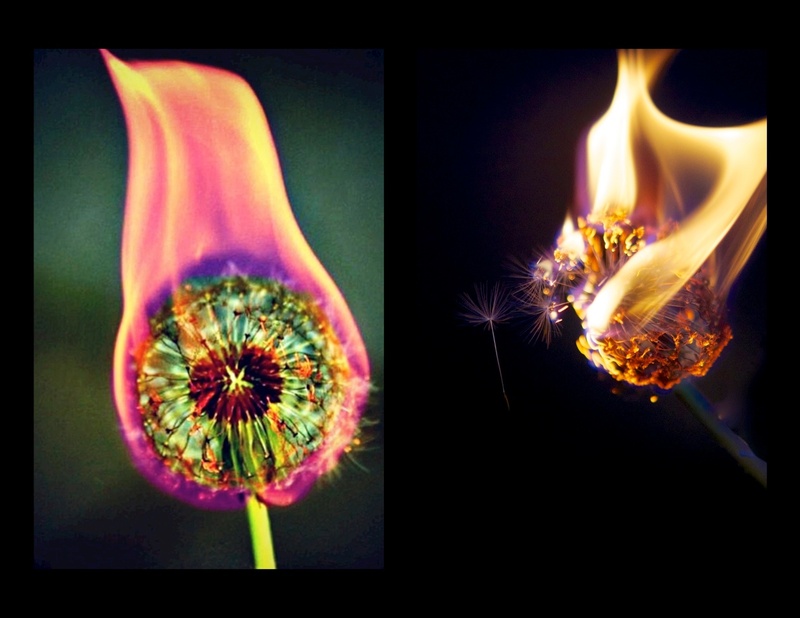 Ever since I saw this colorful picture of a flaming dandelion (left) on Pinterest, I've wanted to re-create that moment (right). New flash: I lit up half a dozen dandelions, and not one of them made pretty colors. I guess not every Pinterest trick can work. So that's all for now, peeps! Check back soon (like, tomorrow) for a new recipe. Until then, happy pinning! I'm sorry you were sick too, it's no fun at all. But I'm glad you enjoyed Angels and Demons, I loved that book!